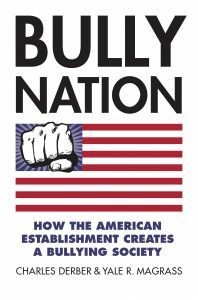 by Yale Magrass & Charles Derber, authors of Bully Nation. Written in response to this article. In Bully Nation, we challenge the widespread idea that children are the main perpetrators or victims of bullying. Rather, we argue that kids who bully are mirroring behavior they see all around them in the adult world. Kids naturally mimic adults, whether it be their parents, their teachers or the President of the United States. In our corporate, militarized society, adults have to bully to get ahead or just survive. So our kids are exposed all the time to adults who are unwittingly teaching them the way to treat others. President Trump is the most visible adult on the planet. And it is hard for anybody – whether child or adult – not to take notice. As President, he legitimates almost any conduct he does, including brutal bullying. As shown in our book and in our many subsequent op-eds, we know from numerous documented reports by teachers that school kids taunt their minority peers saying “The President is going to deport you – go home.” Or “Trump is going to build a wall to keep you out” and then they wall off the targets from playing with them or joining their play group. Or they make fun of disabled kids, the way Trump mocked a disabled reporter. American children not only live in capitalism, but in the world’s dominant militaristic empire. Although Trump may be particularly blatant, as commander-in-chief, all presidents have the duty to be bully-in-chief. Even a softer president like Obama, who did not have an instinctive bullying personality, did not change this requirement. 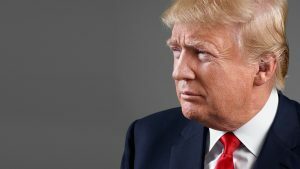 Trump is under investigation and may face impeachment for his possible collaboration with another bully, Russian President Vladimir Putin, in interfering with the recent American election. While what Putin allegedly did may not be defensible, he is hardly alone. Israeli Prime Minister Benjamin Netanyahu more directly intervened in the American election process when he addressed Congress, hoping to rally support for Republicans. American Presidents have a long history of bullying other countries, interfering with their democratic elections, and overthrowing leaders who dared to act contrary to American interests. When Columbia would not permit the United States to build a canal connecting the oceans to expedite corporate trade, President Theodore Roosevelt orchestrated a revolution and created a new country, Panama. In 1953, after the democratically elected Prime Minister of Iran Mohammad Mossaddegh nationalized Iran’s oil industry, the American CIA staged a coop which resulted in the restoration of Shah Mohammad Reza Pahlavi. The following year, President Eisenhower prevented an election in South Vietnam when he was told “a possible 80 per cent of the population would have voted for the communist Ho Chi Minh as their leader.” When, in 1973, democratically elected President Salvador Allende of Chile tried to nationalize mines owned by American corporations Kennecott and Anaconda Copper, the CIA had him overthrown and replaced by General Augusto Pinochet. Yes, Trump is a bully who may inspire children to bully and it is essential to get him out of the White House. However, only a fundamental reorientation of American society, from top to bottom, will reduce bullying. Charles Derber is professor in the Department of Sociology at Boston College. Yale R. Magrass is Chancellor professor in the Department of Sociology/Anthropology at the University of Massachusetts-Dartmouth.